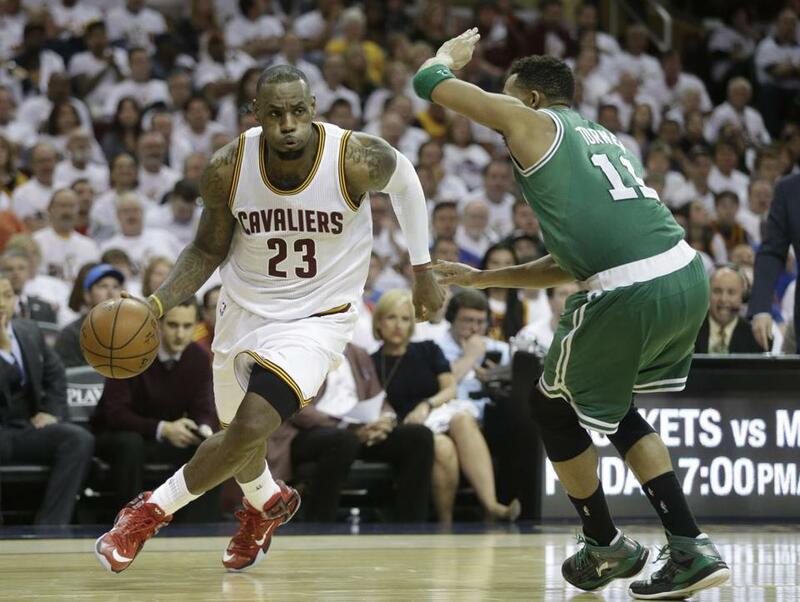 LeBron James drove past Evan Turner in the first game of their playoff series Sunday. CLEVELAND — They dropped confetti from the ceiling here at Quicken Loans Arena at the end of Sunday’s first-round, Game 1, 13-point Cavaliers victory over the 40-42 Boston Celtics. It seemed a little over the top. A little needy. Confetti? Really? First round? First game? Against a sub.-500 team? We can’t really blame these folks. It’s easy to be smug when you come from a city that has celebrated nine championships in this century. I had to brush confetti from my jheri-curl head as recently as Feb. 1, when Pete Carroll made the worst play call in the history of sports. I wasn’t expecting a celebration in the sky when Gigi Datome slinked off the floor Sunday, but anything these Cleveland folks do is OK because they have truly suffered. What must it be like? Cleveland has not won a major sports championship since quarterback Frank Ryan and running back Jim Brown led the Browns to a 27-0 victory over the Baltimore Colts at Municipal Stadium in the 1964 NFL Championship game. It answers the question about the confetti. How is a city supposed to act like it’s been there before when . . . it hasn’t been there in more than a half-century? I love this city. But it is a hungry place, peppered with people with hungry faces. They come downtown and they see a diminished city where commerce and activity once thrived, before the foreclosures and rampant unemployment. Cleveland once was one of America’s five largest cities. Today, downtown Cleveland is a sad space with many vacant buildings and boarded-up stores. The city is quiet on weekends and empty on weeknights after the workforce goes home. It feels like the local economy runs on lottery tickets. At the corner of East Fourth Street and Prospect you can still get a 16-ounce can of Pabst Blue Ribbon for $3 at Flannery’s Pub. Not far from the other end of Fourth Street, there’s the Horseshoe Casino, connected to the Tower City Center. This is not a high-roller crowd. It’s not Ocean’s Eleven. It’s more like Atlantic City-on-the-Cuyahoga. LeBron and the Cavaliers are important because Cleveland is dead or dying, and there hasn’t been a team to make the city feel good about itself since Lyndon Baines Johnson was in the White House. Progressive Field (a.k.a. “The Jake”) is virtually empty on game nights. Terry Francona (remember him?) has pushed the Tribe to overachievement in the last two seasons, but folks who run the franchise are worried that the Indians may not survive. The Indians play in a beautiful ballpark and feature a worthy team, but not enough folks are going to the games. It’s a far cry from the early years at the Jake, when the Tribe sold out 455 consecutive games and featured the star power of Manny Ramirez, Albert Belle, Eddie Murray, Jim Thome, Roberto Alomar, and Omar Vizquel. That crew made it to the seventh game of the World Series in 1997, but Jose Mesa gave it up against the Florida Marlins. Cleveland’s last World Series victory came in 1948 against the Boston Braves. The Browns are a legitimate laughingstock in today’s NFL. They have their own Bill Buckner/Bucky Dent moments. Folks still talk of John Elway thwarting Cleveland with “The Drive” in 1987 and Earnest Byner’s costly fumble one year later. The franchise — last coached by Bill Belichick — moved to Baltimore after the 1995 season, only to come back as an expansion team in 1999. Today they are a clown show, especially at quarterback. Johnny Manziel was at Sunday’s Celtics-Cavaliers game. The Cavaliers made it to the NBA Finals with LeBron in 2007, but were swept by the Spurs. They thought they were going to win in 2010, but that was when the Celtics’ Big Three shocked Cleveland in the conference semifinals and LeBron ripped off his Cavs jersey for (we thought) the last time as he exited Boston’s parquet floor in disgrace. Then came “The Decision’’ and the burning of LeBron’s jersey on the streets of Cleveland. 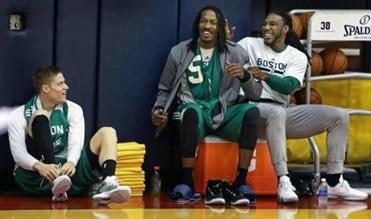 The Celtics represent a mere speed bump for this LeBron locomotive. Cleveland is desperate for the Cavaliers to win. ESPN is desperate for the Cavaliers to win. And the forecast for Tuesday night’s game at the Q is partly cloudy with a strong chance of confetti.